Cathy is a strong, confident, and independent woman. She doesn’t need a man in her life; but she wants a man in her life. After her divorce 15 years ago, she raised her two sons as a single mom and became a successful business woman. She has a wide circle of friends, is funny, likes to travel and enjoys her life. Anne has an ex-husband that is also a part-time terrorist; I’m convinced of it. She also has a business relationship that’s borderline abusive that she’s trying to un-wind. She’s an incredibly caring person with a good spirit and never treats anyone unkindly. Anne just wants the people in her life to treat her with the same kindness and respect that she extends to everyone else. That’s the only answer you need to know. Some really interesting things happen when I share my story in a public way. Many women step forward and say, “Me too; that’s my story. I also was in a marriage where there was very little connection or passion.” It’s a beautiful gift to know that we’re not alone and that whatever we’re going through, someone else out there has also had that experience. When hearts are broken, it hurts. I’ve lost jobs. I’ve lost friendships. I’ve lost my footing, but nothing kicked me in the stomach and opened me up the way a broken heart did. I had lunch with a dear friend this week and he was sharing with me the experience he had recently at Yosemite National Park with his partner and children. His enthusiasm about the Giant Sequoias they saw and the majesty and magic they experienced on their trip all brought chills to me. As he was talking, the life coach in me couldn’t resist the beautiful metaphor that nature provides to us for our lives. 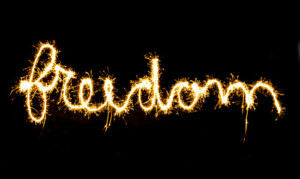 I am drawn to the idea of having more freedom in my life. I want to live my life from a place of choice, rather than from a place of obligation.